Public safety radios have been upgraded from analog to digital since the 1990s because of the limitations of analog transmission, and also because of the technological advances and expanded capabilities of digital radio. Varying user protocols and different public safety radio spectrum, made it difficult for Public Safety to achieve interoperability and widespread acceptance among the public safety agencies. However, the lessons learned during the disasters that the United States faced in the past decade, have forced agencies to assess their requirements during a disaster when the basic infrastructure is in a state of failure. To meet the growing demands of public safety digital radio communications, the United States Federal Communications Commission (FCC) at the directive of the United States Congress initiated an inquiry in 1988, to receive recommendations from users and manufacturers to improve the communication systems in existence.Based on the recommendations, in October 1989 APCO Project 25 came into existence in a coalition with the Association of Public-Safety Communications Officials-International (APCO), the National Association of State Telecommunications Directors (NASTD),the National Telecommunications and Information Administration (NTIA), the National Communications System (NCS), the National Security Agency (NSA) and the Department of Defense (DoD), to find solutions that best serve the needs of public safety management.In addition, a steering committee consisting of representatives from the above mentioned agencies along with FPIC (Department of Homeland Security Federal Partnership for Interoperable Communication), Coast Guard and the Department of Commerce's National Institute of Standards and Technology (NIST), Office of Law Enforcement Standards was established to decide the priorities and scope of technical development of P25. Interoperable emergency communication is integral to initial response, public health, safety of communities, national security and economic stability. Of all the problems experienced during disaster events, one of the most serious problems is communication due to lack of appropriate and efficient means to collect, process and transmit important and timely information. In some cases, radio communication systems are incompatible and inoperable not just within a jurisdiction but within departments or agencies within the same community. Non-operability occurs due to use of outdated equipment, limited availability of radio frequencies, isolated or independent planning, lack of coordination and cooperation between agencies, community priorities competing for resources, funding and ownership and control of communications systems. Recognizing and understanding this need, Project 25 (P25) was initiated collaboratively by public safety agencies and manufacturers to address the issue with emergency communication systems. P25 is collaborative project to ensure that two-way radios are interoperable. The goal of P25 is to enable public safety responders to communicate with each other and, thus, achieve enhanced coordination, timely response, and efficient and effective use of communications equipment. P25 was established to address the need for common digital public safety radio communications standards for first-responders and homeland security/emergency response professionals. The Telecommunications Industry Association's TR-8 engineering committee facilitates such work through its role as an ANSI-accredited standards development organization (SDO) and has published the P25 suite of standards as the TIA-102 series of documents, which now include forty-nine separate parts on Land Mobile Radio and TDMA implementations of the technology for public safety. P25 is applicable to LMR equipment authorized or licensed, in the U.S., under the NTIA or FCC rules and regulations. P25 equipment has also been selected for a railroad system, including rolling stock, personnel, and transportation vehicles. P25-compliant systems are being increasingly adopted and deployed. Radios can communicate in analog mode with legacy radios, and in either digital or analog mode with other P25 radios. Additionally, the deployment of P25-compliant systems will allow for a high degree of equipment interoperability and compatibility. P25 standards use the proprietary Improved Multi-Band Excitation (IMBE) and Advanced Multi-Band Excitation (AMBE+2) voice codecs which were designed by Digital Voice Systems, Inc. to encode/decode the analog audio signals. 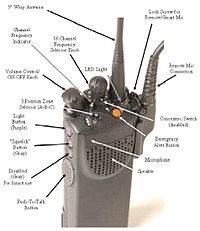 P25 may be used in "talk around" mode without any intervening equipment between two radios, in conventional mode where two radios communicate through a repeater or base station without trunking or in a trunked mode where traffic is automatically assigned to one or more voice channels by a Repeater or Base Station. The protocol supports the use of Data Encryption Standard (DES) encryption (56 bit), 2-key Triple-DES encryption, three-key Triple-DES encryption, Advanced Encryption Standard (AES) encryption at up to 256 bits keylength, RC4 (40 bits, sold by Motorola as Advanced Digital Privacy), or no encryption. The protocol also supports the ACCORDION 1.3, BATON, Firefly, MAYFLY and SAVILLE Type 1 ciphers. Telephone Interconnect Interface – standard specifies the interface to Public Switched Telephone Network (PSTN) supporting both analog and ISDN telephone interfaces. P25-compliant technology is being deployed in several phases, each offering several advantages. Phase 1 radio systems operate in 12.5 kHz analog, digital or mixed mode using FDMA access method. Phase 1 radios use Continuous 4 level FM (C4FM) modulation—a special type of 4FSK modulation — for digital transmissions at 4800 baud and 2 bits per symbol, yielding 9600 bits per second total channel throughput. Receivers designed for the C4FM standard can also demodulate the "Compatible quadrature phase shift keying" (CQPSK) standard, as the parameters of the CQPSK signal were chosen to yield the same signal deviation at symbol time as C4FM while using only 6.25 kHz of bandwidth. Phase 1 uses the IMBE voice codec. Vendors are currently shipping Phase 1 P25-compliant systems. These systems involve standardized service and facility specifications, ensuring that any manufacturers' compliant subscriber radio has access to the services described in such specifications. Abilities include backward compatibility and interoperability with other systems, across system boundaries, and regardless of system infrastructure. In addition, the P25 suite of standards provides an open interface to the radio frequency (RF) subsystem to facilitate interlinking of different vendors' systems. To improve spectrum utilization, Phase 2 has been developed using a 2-slot TDMA scheme. Phase 2 uses the AMBE+2 voice codec to reduce the needed bitrate so that one voice channel will only require 6000 bits per second (including error correction and signalling). Significant attention is also paid to interoperability with legacy Phase 1 equipment, interfacing between repeaters and other subsystems, roaming capacity and spectral efficiency/channel reuse. In addition, Phase 2 work involves console interfacing between repeaters and other subsystems. From 2000 to 2009 the European Telecommunications Standards Institute (ETSI) and TIA were working collaboratively on Public Safety Partnership Project or Project MESA (Mobility for Emergency and Safety Applications), which sought to define a unified set of requirements for next-generation aeronautical and terrestrial digital wideband/broadband radio standard that can be used to transmit and receive voice, video and high-speed data in wide-area, multiple-agency networks deployed by public safety agencies. The final functional and technical requirements have been released by ETSI and were expected to shape the next phases of American Project 25 and European DMR, dPMR, and TETRA, however no interest from the industry followed as the requirements could not be met by available commercial off-the-shelf technology, and the project was closed in 2010. In the United States, the FCC has assigned the 700 MHz radio band freed after digital TV transition to public safety networks, and expects providers to employ LTE for high-speed data and video applications. P25 systems do not support Continuous Tone-Coded Squelch System (CTCSS) tone or Digital-Coded Squelch (DCS) codes for access control. Instead they use what is called a Network Access Code (NAC). This is a 12 bit code that prefixes every packet of data sent (including voice packets). The NAC is a feature similar to CTCSS or DCS for analog radios. That is, radios can be programmed to only pass audio when receiving the correct NAC. NACs are programmed as a three-hexadecimal-digit code that is transmitted along with the digital signal being transmitted. Since the NAC is a three-hexadecimal-digit number (12 bits), there are 4096 possible NACs for programming, far more than all analog methods combined. 0xf7f ($F7F) – a repeater receiver set for this NAC will allow all incoming decoded signals and the repeater transmitter will retransmit the received NAC. Adoption of these standards has been slowed by budget problems in the US; however, funding for communications upgrades from the Department of Homeland Security usually requires migrating to APCO-25. It is also being used in other countries world wide including Australia, New Zealand, Brazil, Canada, India, Singapore and Russia. As of mid-2004 there were 660 networks with P25 deployed in 54 countries.At the same time in 2005 the European Terrestrial Trunked Radio(TETRA) was deployed in sixty countries however and it is the preferred choice in Europe, China and other countries. This is largely based on the fact that TETRA systems are many times cheaper than P25 systems ($900 vs $6,000 for a radio). This leads to the situation that almost all P25 networks are based in Northern America where it has the advantage that a P25 system has the same coverage and frequency bandwidth as the earlier analogue systems that were in use so that channels can be easily upgraded one by one. Both P25 and TETRA can offer varying degrees of functionality, depending on available radio spectrum, terrain and project budget. While interoperability is a major goal of P25, many P25 features present interoperability challenges. In theory, all P25 compliant equipment is interoperable. In practice, interoperable communications isn't achievable without effective governance, standardized operating procedures, effective training and exercises, and inter-jurisdictional coordination. The difficulties inherent in developing P25 networks using features such as digital voice, encryption, or trunking sometimes result in feature-backlash and organizational retreat to minimal "feature-free" P25 implementations which fulfill the letter of any APCO-25 migration requirement without realizing the benefits thereof. Additionally, while not a technical issue per se, frictions often result from the unwieldy bureaucratic inter-agency processes that tend to develop to coordinate interoperability decisions. In 2011, the Wall Street Journal published an article describing research into security flaws of the system, including a user interface that makes it difficult for users to recognize when transceivers are operating in secure mode. According to the article, "(R)esearchers from the University of Pennsylvania overheard conversations that included descriptions of undercover agents and confidential informants, plans for forthcoming arrests and information on the technology used in surveillance operations." The researchers found that the messages sent over the radios are sent in segments, and blocking just a portion of these segments can result in the entire message being jammed. "Their research also shows that the radios can be effectively jammed (single radio, short range) using a highly modified pink electronic child’s toy and that the standard used by the radios 'provides a convenient means for an attacker' to continuously track the location of a radio’s user. With other systems, jammers have to expend a lot of power to block communications, but the P25 radios allow jamming at relatively low power, enabling the researchers to prevent reception using a $30 toy pager designed for pre-teens." The report was presented at the 20th Usenix Security Symposium in San Francisco in August 2011. The report noted a number of security flaws in the Project 25 system, some specific to the way it has been implemented and some inherent in the security design. The report did not find any breaks in the P25 encryption, however they observed large amounts of sensitive traffic being sent in the clear due to implementations problems. They found switch markings for secure and clear modes difficult to distinguish (∅ vs. o). This is exacerbated by the fact that P25 radios when set to secure mode continue to operate without issuing a warning if another party switches to clear mode. In addition, the report authors said many P25 systems change keys too often, increasing the risk that an individual radio on a net may not be properly keyed, forcing all users on the net to transmit in the clear to maintain communications with that radio. One design choice was to use lower levels of error correction for portions of the encoded voice data that is deemed less critical for intelligibility. As a result bit errors may be expected in typical transmissions, and while harmless for voice communication, the presence of such errors force the use of stream ciphers, which can tolerate bit errors, and prevents the use of a standard technique, message authentication codes (MACs), to protect message integrity from stream cipher attacks. The varying levels of error correction are implemented by breaking P25 message frames into subframes. This allows an attacker to jam entire messages by transmitting only during certain short subframes that are critical to reception of the entire frame. As a result an attacker can effectively jam Project 25 signals with average power levels much lower that the power levels used for communication. Such attacks can be targeted at encrypted transmissions only, forcing users to transmit in the clear. Because Project 25 radios are designed to work in existing two-way radio frequency channels, they cannot use spread spectrum modulation, which is inherently jam-resistant. An optimal spread spectrum system can require an effective jammer to use 1000 times as much power (30 db more) as the individual communicators. According to the report, a P25 jammer could effectively operate at 1/25th the power (14 db less) than the communicating radios. The authors developed a proof-of-concept jammer using a Texas Instruments CC1110 single chip radio, found in an inexpensive toy. Certain meta data fields in the Project 25 protocol are not encrypted, allowing an attacker to perform traffic analysis to identify users. Because Project 25 radios respond to bad data packets addressed to them with a retransmission request, an attacker can deliberately send bad packets forcing a specific radio to transmit even if the user is attempting to maintain radio silence. Such tracking by authorized users is considered a feature of P25, referred to as "presence." The reports authors concluded by saying "It is reasonable to wonder why this protocol, which was developed over many years and is used for sensitive and critical applications, is so difficult to use and so vulnerable to attack." The authors separately issued a set of recommendations for P25 users to mitigate some of the problems found. These include disabling the secure/clear switch, using Network Access Codes to segregate clear and encrypted traffic and extending key life.